Mourning is exhausting, relentlessly rolling, invisible to the people around who’s daily lives bring temporary relief. The hangover tiredness hasn’t lifted 3 months after his leaving. By the end of the year this room will look like a guest bedroom; shelves removed, walls papered and painted, new carpet. 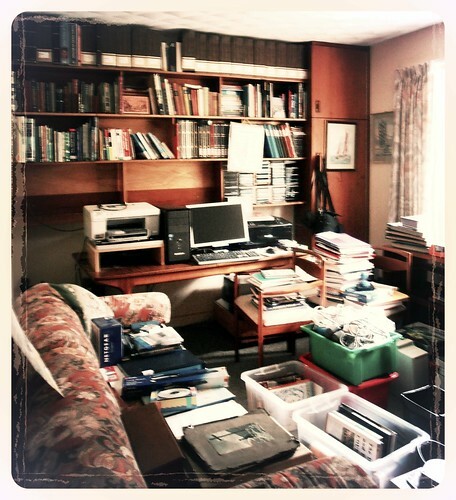 Dad’s stuff long since reorganised and prioritised. It’s this removal that hurts the most. I can understand why people keep rooms untouched as memorials to their past owners. This scribble was published on Sunday, March 2nd, 2014. You can follow any banter on this scribble with the RSS 2.0 feed. You can share your inspired musings after typing the anti spam word near the bottom of the page. But no Pinging because its too naughty.